If you're using Apple's iPhone, iPad, or iPod touch smartphone or tablet devices powered by iOS Firmware and wants to transfer data, photos, apps, music, or videos to your Windows or macOS powered PCs or Laptops, then you can do this in an easy way by using third-party software called "IOTransfer" which is available for free. 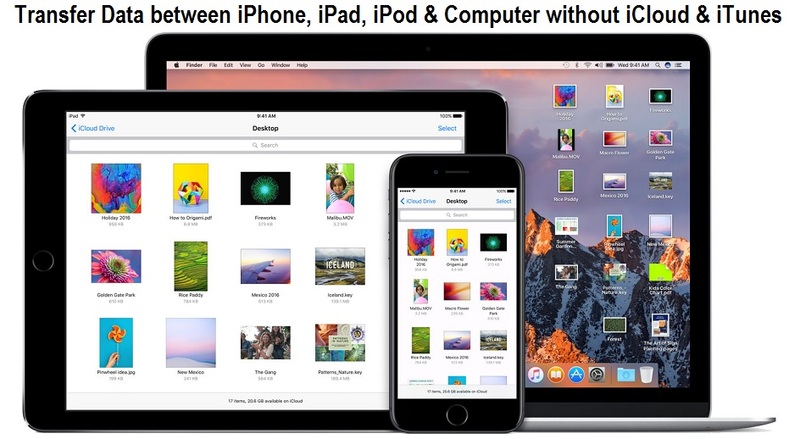 You can even manage your iPhone and transfer old iPhone data to new iPhone or even between another iPhone, iPad, iPod touch, Windows PCs, macOS computers and laptops without iCloud and iTunes software. The IOTransfer software can perform various difficult tasks and things in an easy way without any complication and technical requirements because it's a free iPhone transfer tool available for Windows and macOS devices. If your device storage capacity is full and you want to regain some free storage without compromising on your various data, photos, apps, music, or videos, then you can take backup of all these things from iPhone/iPad/iPod to your computer or laptop, and then again you can restore all data back to your iOS-powered device without iCloud and iTunes. By using this specific software tool users can also easily manage and transfer iPhone photo, video, and music multimedia files quickly within minutes to save your precious time, and to share your best life moments anywhere, anytime. You can export and import pictures and photos from your computer to your Apple device in one-click, because it's all-in-one iPhone transfer and sync software, and has been developed to sync and move data and files from old iPhone to new iPhone without iTunes and iCloud requirement. If you have got videos and audios file on your iDevice, then you can remove and delete large files to free up space by using find and search feature and function. You can enjoy your movies and videos where you want with drag and drop option, which allow users to share moments with friends and family members in simple and fast manner. It also has an effective data backup feature through which you can get the backup of your iPhone videos and music files and can prevent yourself from any data loss before any sad incident take place such as; data damage, data stealing, accidental deletion of data etc. You can even backup device messages, podcasts, contacts, books, voice memos, applications and many more things with safety and security without iTunes and iCloud. So what are you waiting for? Free download and install IOTransfer software tool on any version of your Windows and macOS systems now to get started.